For the past several months, I had been counting down to a major milestone in Canadian motorsports that happened 40 years ago on this exact date. On September 29th 1974, a stock car driver from the modest community of Ailsa Craig, Ontario pulled off a feat no competitor outside of the United States had accomplished. Taking place at the 0.526-miles short track oval of Martinsville Speedway, a 33-year old Earl Ross crossed the finish line first at a NASCAR Winston Cup (now Sprint Cup) event. 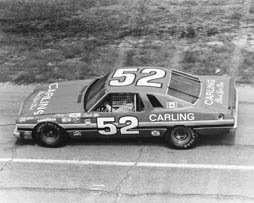 Driving a #52 Carling-sponsored Chevrolet owned by Junior Johnson, Ross won the Old Dominion 500 with a full lap lead over second-place Buddy Baker. Entering victory lane, the prominent Canadian maple leaf flag was carried onboard Ross's #52 car allowing his country to share in part of the celebration four decades ago. Mentioning the 500-lap Martinsville Speedway race as a triumphant moment for Canada on the world stage, the memory of this moment is now also a memorial. On this past Thursday, September 18th, sadness was shared among the Canadian stock car racing community as Earl Ross had passed away at the age of 73. Having heard news of his passing, I thought it would be more fitting to give tribute to him on this 40th anniversary the legendary Canada's win against the titans of NASCAR. A humble athlete, Earl Ross became a standout in Canadian short track racing prior to his high profile venture south of the border. Outside of London, Ontario was the place where his name grew into a something heard with enthusiasm by race fans but also trembled with fear in the eardrums of on-track competitors. Delaware Speedway was the scene where Ross demonstrated speed and consistency. The 1968 Late Model champion when the oval was ¼-mile, Earl Ross captured the Diamond and Late Model crown at a half-mile Delaware track in 1970. At this time and through the latter part of his career, the popular Canadian short track of Delaware Speedway presided as a special place for the driver. 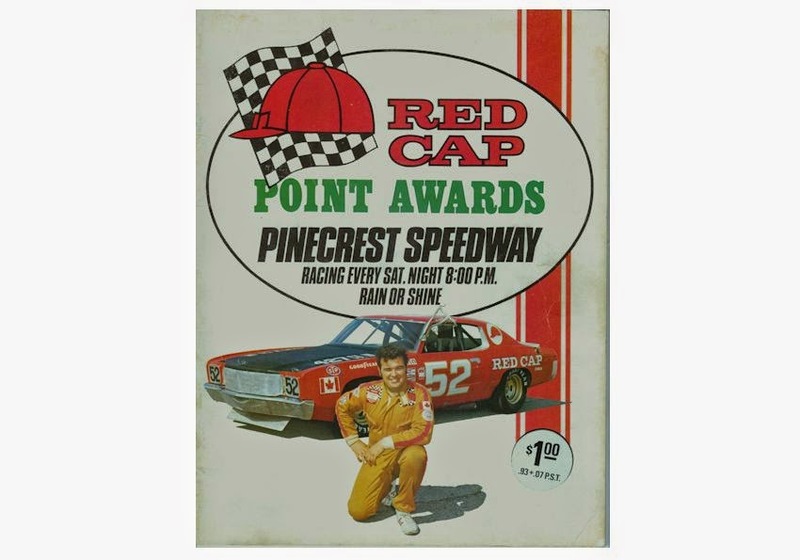 In 1973, Ross first began burning pavement in major American stock car racing competition with major funding coming from Carling’s Red Cap Ale. 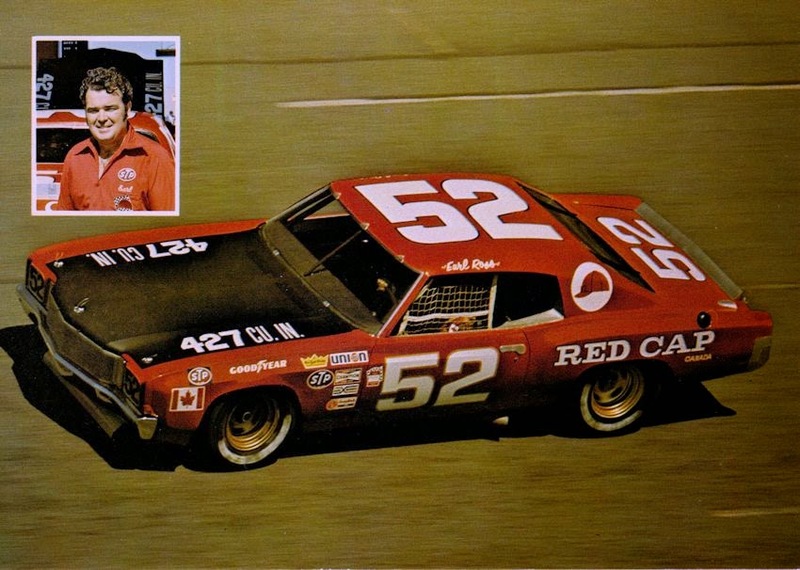 A far cry from the half-mile Canadian track he cut his teeth, Earl Ross was first fielded by an ARCA race driving a #52 Chevrolet on the grand 2.5-mile Daytona International Speedway. Starting 11th, Ross finished the race 13th in his maiden event on the superspeedway. A week later, the Canadian stock car wheelman received a baptism by fire in the NASCAR Winston Cup series racing in the Daytona 500. Ross qualified 30th in the so-called Great American Race piloting a Bobby Allison Racing car owned by Allan Brooke. His first NASCAR race lasted only 34 laps when a valve problem ended his first run against stock car greats like Richard Petty, Cale Yarborough and A.J. Foyt. Ross made two more NASCAR Cup Series starts in 1973 at Talladega and Michigan but was met with mechanical problems on both occasions. In those early races, the Brooke-fielded car also featured Canadian crew chief Ken McKichan and several other Canadian crew members. Getting his feet wet in the waters of the United States stock car competition in 1973, 1974 would be an all-out campaign for the Canadian. The year started once-again at Daytona in an ARCA race. In the 30-car, 200-mile race, Earl Ross qualified third and finished third. Following the second-runner-up finish, Ross’ 1974 NASCAR season started with his first completed race in Winston Cup resulting in an 11th place run. After the Daytona race, the driver of the #52 car showed the circuit just what kind of talent could be bred on a Canadian short track. Ross took fifth in the World 600 at Charlotte Motor Speedway and finished runner-up to Richard Petty at the June race on the two-mile Michigan International Speedway. After Michigan, famous former driver and renowned team owner Junior Johnson took responsibility for the #52 Chevrolet. During the month of September in 1974, Earl Ross was red hot. Qualifying on the front row at Richmond, he amassed back-to-back top-5 finishes at Dover and North Wilkesboro Speedway. It was at the end of that month where Ross pulled off his best ever result in NASCAR. Starting 11th in the 500-mile event, Earl Ross won the Martinsville Speedway race after leading 79 laps in his 1972 Chevrolet race car. It was the first victory in the NASCAR’s top series by a non-American driver (the only until Juan-Pablo Montoya‘s win at Sonoma in 2007). In addition to winning at Martinsville, Ross grabbed the 1974 NASCAR Winston Cup Rookie of the Year award and finished eighth in the overall points. Despite 1974’s accolades, 1975 would not prove as fulfilling for Earl Ross. Due to Carling cut funding of his NASCAR efforts, Ross’ career in the south was effectively parked. He would make a pair of one-off appearances driving for Julie Donlavey in 1975 and L.G. DeWitt in 1976 with limited success. One of his last efforts in the Cup series came in 1978 attempting but failing to make that year’s Daytona 500. Following his unceremonious end in NASCAR Winston Cup competition after a victorious but short 26-race career, Ross would make the odd appearance in ARCA, ASA, NASCAR Modified and even an SCCA Trans Am event at Mosport in the late 1970s into the 1980s. Returning to Canada and his old stomping ground of Delaware Speedway, Earl Ross entered the first McKerlie Millen 200 race in 1982. While it seemed that the former NASCAR Cup series Rookie of the Year had hung up his helmet, he remerged as a participant in the CASCAR Super Series during the mid-1990s driving a Ford co-owned by series champion Dave Whitlock. Competing for several seasons, the now-senior Ross could still pull off some impressive runs including a third at Capital City Speedway in 1997. Shortly following his retirement from CASCAR, his entire career was immortalized by inception to the Canadian Motorsport Hall of Fame in 2000. Spending the better part of his 73 years on Earth wheeling a stock car on some of North America’s most challenging tracks, the legacy of Earl Ross has been a modest one. Despite the Canadian’s NASCAR Winston Cup series success, the time and even difficulty of some sports fans to truly accept driving a race car as an athletic competition has kept the achievement farther from the minds of the mainstream. For Earl Ross and his fans, there has been no request for vanity on what was a monumental moment in time 40 years ago at Martinsville. What Earl Ross proved in his life was how glorious, incredible feats sometimes arrive from an unassuming persona. Thank you to www.canadianracer.com and www.ultimateracinghistory.com for aiding in the compilation of this article.